Blessed Saint Odran, faithful and loyal to God and man! you whose name is almost forgotten by those who owe you an everlasting debt of gratitude, accept our poor thanksgiving, offered in the name of all Ireland, for your noble sacrifice of your life to save that of Ireland's Apostle. You had toiled in his service long and devotedly; you had learned what priceless service he could render to God and the Irish land and, when the moment came when he or you should die, by pagan hands, quickly and resolutely you laid down your life, that your master might live and labour for the Divine Master of all. By your crown of martyrdom so gloriously won, by your centuries of endless peace and joy, we beseech you to look down on the toiling sons of Ireland and on those who try to guide them to their eternal rest. Look down on us all, O blessed Saint! for the love of him whose heart burned with love for Ireland, and pray that the blessing of the Triune God - Father, Son and Holy Ghost - may descend on us and remain with us for ever. Amen. St. Anthony's Treasury - A Manual of Devotions (Anthonian Press, Dublin, 12th edition, 1941), 285-286. At the 19th of February, Colgan and the Bollandists have entered some biographical notices of this holy archbishop, who enjoyed the supreme ecclesiastical dignity in Ireland for a brief period. Nodtat or Nuada, bishop, is mentioned in the Martyrologies of Tallagh, of Marianus O'Gorman, and of Donegal, on this day. He was at first a monk, and also an anchorite. From this state of life, and even against his own will, he had been promoted to the abbatial, and thence translated to the archiepiscopal dignity. His birth-place or residence is said to have been situated at Lough Uama. This signifies the "lake of the cave," the water being said to rise out of a cavern, and the position is also assigned to Breiffny. Here, it is thought, he led the life of an anchoret. The lough, to which allusion has been made, was in the present county of Leitrim. It sometimes flowed back into that cave, whence it issued ; and, the people living on its borders especially believed, that this was an indication of the Dynast's approaching death, or that of his children. Ancient Breffny comprehended the present counties of Cavan and of Leitrim. It was divided into Upper and Lower, or East and West Brefiny. In the latter division, called Brefiny Hy-Ruairc, our saint must have lived, until he was called to a higher dignity, on the death of St. Torbach Mac Gorman. This event took place, on the 16th of July, A.D. 812. Archbishop Nuad visited Connaught, A.D. 810 or 815; and, he is there reported, to have made a reformation of some abuses, which had crept into the churches. 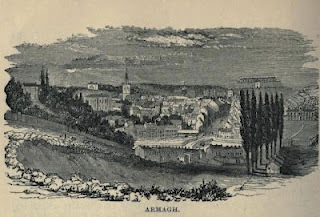 The Catalogue of the Armagh Primates allows three complete years, for the presidency of Nuad ; but, these must be understood, with the addition of some months, reckoning from the death of Torbach, on the 16th of July, A.D. 812, to the 19th of February, A.D. 816. Other authorities, however, place his demise before this date, viz., at the year 811 or 812. Under the year 811, this passage occurs in the Annals of Ulster, "Nuad of Loch-Huama, bishop, anchorite, and Abbot of Armagh, fell asleep." Lanigan's Ecclesiastical History of Ireland says that 'in 811 Nuad made a visitation of some part of Connaught and on that occasion relieved some churches there from an annual offering, which used to be made to that of Armagh' (Vol 3, p.252). The Ancient List of the Coarbs of Patrick lists Nuada as the 33rd holder of the episcopal see of Armagh. 17 February is a date on which many saints are commemorated in the Irish calendars of whom Saint Ossan of Rathossain in County Meath is one of the lesser-known . In O'Hanlon's account below I find it curious that there are supposed to be two different saints of this name commemorated on the same day, but the earlier, Patrician saint is not as well-attested as the seventh-century Ossan whose repose is recorded in various Irish Annals. Colgan has some notices, regarding this saint, at the 17th of February. He was born, most probably about, or after, the beginning of the seventh century. According to Duald Mac Firbis, we find a Bishop Ossan, from Rath-Ossain, to the west of Ath Truim. It is thought,that he died on the 17th of February, A.D. 686. He is considered to have lived, at a period, somewhat earlier, than another homonymous saint venerated here, and on the same day. Colgan thinks, that a St. Ossan, at or near Trim, is alluded to, as one of the makers of sacred vessels for St. Patrick, under the name of Essa. Yet, this is clearly irreconcilable with chronology. However this be, Ossan, Bishop, is the only mention made of him, in the Martyrology of Tallagh. The Martyrologist, Marianus O'Gorman, calls him "candidus." In a moral sense, this word indicates his character for intergrity or innocence. If it refer to his physical appearance, we may assume that he was a man of clear or fair complexion. We read, as entered in the Martyrology of Donegal, on this day, Ossan, Bishop, of Rath Ossian. His place is particularly pointed out, as being near the western gate of the ancient borough or city of Trim. The " Annals of the Four Masters " place his death at A.D. 685, while calling him Bishop of Mainistir, or "of the Monastery." The "Annals of Ulster" have his demise at A.D. 686. St. Forannan, Abbot of Clonard, County of Meath. We read on this day, in the Martyrology of Donegal, that Forannan, Abbot of Cluain Eraird, was venerated. He is said, also, to have been Abbot of Kildare, and to have died, on the 12th of February, A.D. 740, according to the Annals of the Four Masters,- or according to those of Ulster, A.D. 744.
yet again of Ruman the amiable, a bishop who was " a shrine of wisdom, illustrious, acute, a man of virgin purity," and " loved by the hosts of the assembled people." Then we have Colman, the " wise doctor," and Maelmochta, " the head of the piety and wisdom of Ireland ; " Tuathal, the bishop, who " died after a good life," and Oengus, lord of Laeghaire, who, after a life of turmoil, retired to spend at Clonard his declining days, but was followed thither by his foes, and slain by the lord of Delvin. Such entries suggest many thoughts, but it is left to the imagination to fill in the picture. They tell, however, that the place was the abode of learning and piety, where good and learned men served their generation by the will of God. St. Gobnet is one of many early Irish saints about whom there is no written record, only a continuing and deep love and devotion amongst the people of the countryside that she had travelled, and a handful of traditional stories. Her connection with St. Abban puts her in the 6th century but there is no further definition to be had about her dates. She was on the Aran Islands and founded a church there and the islanders still honour her on her day, February 11th. The tradition is that she came seeking shelter on the islands from some enemy in Co. Clare. But she was not to remain there permanently, for an angel appeared and told her that that she must go and seek a place where nine white deer were grazing. There she would found a convent and settle permanently, there she would die and there would be, in the Irish phrase, the ‘place of her resurrection’. So Gobnet went back to the mainland and travelled over southern Ireland seeking the white deer. There are a number of old Celtic church sites and holy wells bearing her name, and most of these still seem to be venerated and visited. They include a site at Dungarvan, in Co. Waterford, and at Ballyagran near Charleville, the Kerry sites of Dunquin, looking out to the Blasket Islands, and of Cahirciveen. Not till she came to Clondrohid in Co. Cork did she meet any deer, but there she found three white ones grazing. 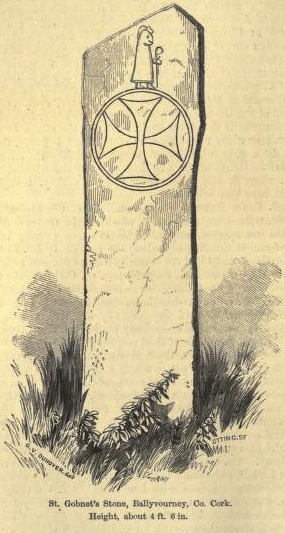 Here is a special stone still venerated in her name, Cloch Ghobnatan, Gobnet’s stone, and it is traditional to carry a coffin deiseal once round this before the burial takes place. Next the saint met six white deer, at Ballymakeera, the next hamlet to Ballyvourney; finally at the latter place she found the full complement of deer. St. Gobnet’s little settlement is in a place where one might indeed expect to find nine white deer grazing. The River Sullane, a tributary of the Cork Lee, takes origin in the moorland and rock of the Derrynasaggart mountains, flowing from them into a deep but spacious valley, its flanks checkered with fields, broken with woodland and coppice. Even today one can realize the kind of place it was in the 6th century, little fields amongst trees and grassy stretches of sunlit turf amongst the woods of birch and hazel and oak, where one would come upon deer grazing peacefully. Gobnet’s convent was high up on the slope of the valley, set well above the river, amongst this bosky country where the rock begins to show through the grass, and the fields end against moor and wood; from it there is a great outlook down the river valley. There are some pleasant traditions about St. Gobnet and her nuns at Ballyvourney. How a robber tried to build a castle in the glen and how Gobnet resisted him, throwing a stone ball at his constructions as soon as he had begun them and knocking them down. The ball returned to Gobnet of itself; eventually the man tired of his fruitless labour and went away; but the miraculous stone ball is still venerated at Ballyvourney, preserved in a niche in the wall of the old church. Again, another robber came to drive off all the Ballyvourney people’s cattle. St. Gobnet was a great bee-keeper; she turned the bees onto him and he, not unnaturally, fled, leaving behind his prey of beasts. One account makes the rather unnecessary addition of each bee turning into an armed soldier for the attack. St. Gobnet is always represented in art with her bee skip, or beachaire. The saint also stopped the plague spreading into the district, by her prayers; when illness did come she was a good nurse. One of her nuns was sick and Gobnet took her to a sequestered glen to recover, praying God that no noise or disturbance would worry the nun. Ever since not even the loudest thunder has been heard in this place. The saint was also noted for her kindness and generosity to the poor; when she was very young she was taking meat to give to the poor. She met her father, who objected violently to these practices, and demanded to know what she was carrying. She was forced to produce her basket, but it was full of flowers into which the meat had been miraculously changed. Out of the traditions something emerges; the little community of women on the hillside, with their bees and their garden and a little farm; Gobnet helping the Ballyvourney people and curing their sicknesses. The convent is no longer there but the saint’s help remains, and to ask her assistance the crowds still come both on February 11th and on Whitsunday, when a second big pilgrimage takes place…..
D.D.C. Pochin Mould, Irish Pilgrimage (Dublin, 1955), 93- 95. St. Airennan, Bishop of Tallagh, County of Dublin. The Martyrology of Tallagh enters Airendan, Bishop of Tallaghta, at the 10th of February, and in the Martyrology of Donegal, we find entered, on this day, the name of Airennan, Bishop of Tamhlacht, now Tallagh, in the county of Dublin. He was born, most probably, during the earlier part of the eighth century; and, it is also likely, that he made his religious profession at, or soon after, the foundation of Tallagh, in the year 769. Under the head of Tamlacht, Duald Mac Firbis places Airennan, or Erennan, Bishop of Tamlacht, at February 10th. In the Dublin extracts, belonging to the Irish Ordnance Survey, and at the same date, in the Irish Calendar, we have this holy man's name occurring, as connected with Tamlacht. This, too, agrees with Ward's statement. As St. Melruan, the founder died, A.D. 787, or recte 792 the promotion of St. Airennan must be deferred to a subsequent period; and, accordingly, we find his death announced as Airfhindan, Abbot of Tamhlacht-Maeleruain (Tallaght), at A.D. 798, or recte 803. He therefore seems to have been the immediate successor of St. Melruan, whom he survived in office, only for a few years. He must, also, have been the companion of St. Oengus the Culdee, at Tallagh. In our calendars, we find the name of a St. Aireran, also called Aileran, surnamed "the Wise," Abbot of Clonard. The present saint's name is not very dissimilar. He is also known as Airenan, and called " the Wise." " He appears to have exercised the duties of a bishop, in addition to those of abbot. So far as we know, he is not distinguished as a writer. 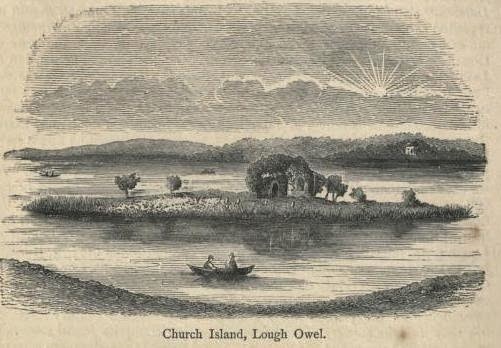 Through the kind offer of Mr. De Blaquiere, who, on casually learning a clergyman's desire to see the old church there, with the ready courtesy of an Irish gentleman sent his pleasure boat and servant for the purpose, with instructions, that both were to be at the writer's disposal whatever time he might deem necessary for exploration on Lough Owel. Weren't those the days when a gentleman would send his servant and pleasure boat to accommodate a clergyman? Page 386 of Volume II of the Lives of the Irish Saints contains a sketch of the servant rowing the Canon to the island. Below is the account of Saint Lomman and his locality from that same volume. It is interesting to note the survival of some of the relics associated with the saint - a bachall and chain - until the mid-seventeenth-century. The chain was used as an aid to women in childbirth and would be placed around the belly of a labouring women to ensure a safe delivery. I saw an example of one of these chains or girdles in the National Museum recently. There is also at least one other Saint Lomman, said to have been a disciple of Saint Patrick and connected with Ath-Trim, but his feastday is commemorated on 11 October. Inevitably, however, there was some confusion in the sources between the two, which O'Hanlon mentions in passing. Among the many beautiful lakes of Westmeath, some may be found to rival Lough Owel, in depth, extent and variety of adjacent scenery; yet, none to surpass it in historic and topographical interest. Anciently was it called Loch Uair, and here, sometime in the sixth century, did the Blessed Lomman select a charming site for the foundation of a religious establishment, on its western banks. Lomman Locha Uair is an entry found in the Martyrology of Tallagh, at the 7th of February. Portlomon or Portlemon is now a parish, in the barony of Corkaree, and in the county of Westmeath. Within its limits is Frum Hill, on the summit of which there is a remarkable rath. Portlemon House, formerly the residence of Lord De Blaquiere, is situated within a finely wooded demesne. This, likewise, encloses the ancient church, and the surrounding graveyard – both of these rise on a gently sloping green ridge, immediately over the waters of Lough Owel. The ruins, about three and a-half miles north-west of Mullingar, measure seventy-seven feet, by twenty feet four inches. A stone, deeply embedded in the clay, was disinterred some years ago. It was shaped like a coffin-lid, and it had a cross inscribed. Probably, it marked the grave of some ecclesiastic, in former times. A tourist or pilgrim, visiting Portloman, must linger long at a place, endeared by so venerable an antiquity, and by so many religious associations. Especially from the old consecrated walls, where the resting-place of so many dead contributes to sacred and solemn remembrances, enchanting scenery is presented on every side. A vast sheet of water spreads far away, to the east and south. The ancient name of the church here seems to have been derived from the present saint, who, probably, was the founder. It was called Tempull Lommain, or " the Church of Lomman." It is likely, a monastery had been established by him, in connexion with it; yet, not at a period so far back, as might be inferred from the statement of those, who would make our saint the- son of Darerca," sister to the Irish Apostle." In this case, St. Lomman should be regarded as nephew to the latter. But, St. Lomman's family and pedigree are assigned to altogether a different stock. He sprang from the race of Conall Gulban. St. Loman was the son of Ernan, son to Cesperius, son of Lathimius, son of Fergus, son to Conall Gulban. This saint, who was the fifth, in descent, must have been a relation of the great St. Columkille; but, he appears to have flourished after the time of the latter. At least, a difference of two generations is noted, in their respective pedigrees. We may therefore set it down as highly probable, that St. Loman—although he might have been born towards the close of the sixth century—yet, did not take an active part in the affairs of life, until the seventh age had somewhat advanced. As we have mentioned, in another place, on the island of Inishmore, in Lough Gill, county of Sligo, a St. Loman is said to have founded a church, in the time of St. Columkille. It may well be questioned, if he were not identical with the present holy man. Perhaps, it might be said, St. Loman of Lough Owel migrated to Lough Gill, at some period of his life; or, it might be, that St. Loman of Lough Gill chose afterwards to live near or on Lough Owel. Yet, our previous calculations, and the data already given, seem to establish a different case. We must observe, however, the similarity of a coincidence in taste, when a St, Loman of the seventh century chose to live near the lake scenery of a loch, lovely as any could be found elsewhere in the ancient province of Meath, while a St. Loman of the sixth age selected his lake-island, in the ancient province of Connaught. As the church and residence of St. Loman, at Lough Gill, were completely insulated, so did we find a very low-lying green dot, far away from Portloman, and on the surface of Lough Owel. It was greatly our wish to visit it, and happily the opportunity was presented. After a pleasant row of two miles, in a direct course, over the still waters of the lough, and on a exceptionally warm day, the writer was landed on Church Island. Here, indeed, were found subjects for solemn consideration. A very interesting old church stands, but in a ruinous state, on the small islet. It was built of fine limestone. Interiorly, it measured thirty-five feet in length, by eighteen feet in width. The walls were three feet in thickness. An end eastern and circularly-headed window was in the gable, as yet tolerably perfect. A window can be seen in the north sidewall, while a door was in the southern side wall. The west gable has completely disappeared. Elder trees grow within and around the ruins, which are also covered with ivy. An old cemetery extended without the church, and about fifty years before, the last corpse had been conveyed to it by boats and attendants from the mainland. Two distinctly marked piles of building stones are to be seen, on the very margin of the lake, and formerly these were more elevated over its surface than at present. They, however, are the debris of old anchoretical houses, now completely dilapidated, but apparently resembling, in former times, the beehive-shaped houses to be found in the west and south of Ireland. It is said, St. Lomman built a small house, in an island of Loch Uair, near Portlomain, and this seems most likely to have been the identical place. Except at the landing-place, and on the higher earth, near the old church and its graveyard, lake-flaggers and reedy-grass lift their tops amid the waters on the islet's margins. St. Lomman is said to have lived on Alexandric herbs, of which there was a great abundance on his island. This was the Smyrnium Olus-atrum, commonly called Alexanders, which was probably a corruption of Olus-atrum. The Irish name, Alistrin, for them, is certainly a corruption of Alexandrine. The Martyrology of Donegal enters the festival of St. Lomman, of Loch h Uair, in Ui-Mac-Uais, in Midhe, at the 7th of February. At the vii. ides of this month, we find, likewise, Lomman, confessor, in Hibernia, is set down [in the Kalendarium Drummondiense] as having departed to Christ. We are informed, that he had another festival, at the 11th of October; this, however, is a mistake. In the seventeenth century, there was a holyday to honour this saint at Portloman, near Multi-Farannain, or Multyfarnham. Then, too, his bachall or crozier was held by Walter Mac Edward [Fitzward?] in Portlommain. His chain, too, was preserved there, towards the middle of the seventeenth century. What has become of both these objects cannot at present be ascertained. Finally, you can see a picture of the inscribed stone referred to in the text here. XXVI.— DUBHTHACH. Coarb 927-938. Ob. Oct. 7. Son of Duban, of the race of Conall Gulban, from whom, according to the pedigree in the Naemhseanchas, he was fourteenth in descent, and in the same line as his predecessor, Maelbrighde. He was abbot of Raphoe as well as of Hy, and is styled by the Four Masters "Coarb of Columcille both in Erin and Alba." Rev. W. Reeves, The Life of Saint Columba: Founder of Hy (Edinburgh, 1874), clxxvi. Máire Herbert, Iona, Kells and Derry - The History and Hagiography of the Monastic Familia of Columba (Dublin, 1996), 80. Professor Herbert makes no reference to a possible date for the feastday of Abbot Dubhthach and thus we cannot be entirely sure if this ninth-century leader of the Columban monastic federation is the saint commemorated today. 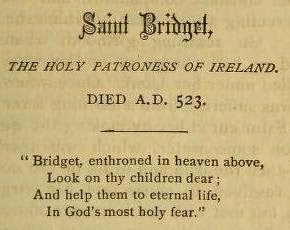 As February 1 is the commemoration of Ireland's national patroness, Saint Brigid of Kildare, below is a nineteenth-century article on her life, taken from a volume published in the United States in 1880. As with the account by Father Albert Barry posted here, the author has drawn on the hagiographical tradition to bring us a stirring account of Saint Brigid's virtues and miracles. 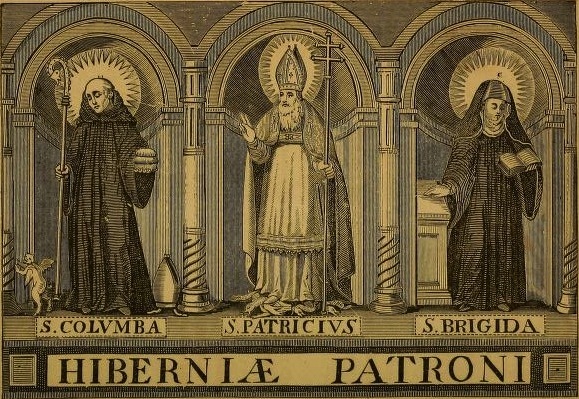 If you would like to read an account of Saint Brigid from the 1930s, then please visit my other site dedicated to our three national patrons here. There I will be publishing new daily posts on Saint Brigid throughout the octave of her feast. ST. BRIDGET , the holy Patroness of Ireland, was born at Faughart,  a village in the present county of Louth, soon after the light of faith began to illumine her lovely native isle. Her parents were Catholics and persons of rank. Bridget's early life was surrounded by the supernatural. It is said that, when a child, angelswere her constant companions, and even aided her in erecting a little altar, at which she amused herself. On reaching girlhood, whatever she touched or had charge of in the way of food multiplied under her hand. Once when her old nurse was suffering from a burning fever the fair young Saint cured her by making the sign of the cross on some water, which was turned into mead — then the common drink of the country. She resolved to consecrate her virginity to heaven, but met with much trouble on account of her rare beauty and the opposition of her parents. Many sought her hand. But finding that the eagerness of a multitude of suitors might, perhaps, hinder her from devoting herself entirely to God, she prayed that her beauty might be changed to ugliness. Her prayer was heard. One of her eyes became greatly enlarged, and her angelic face so altered that both parents and suitors soon left her free to embrace the religious state. Taking with her seven young ladies, Bridget went to Bishop Maccelle,  a disciple of St. Patrick, and requested him to give them the veil. He hesitated for a time, but the lovely Saint re-doubled her prayers. At length, seeing a pillar of fire over her head, he clothed her in the mantle of religion, and received her profession and that of her fair companions. During the ceremony, as Bridget bent her head to receive the holy veil, she placed her hand on the wooden altar-step ; and in a moment the dry wood became green and fresh, her eye was cured, and all the radiance of her former beauty returned. On one occasion, as the Saint and her nuns were enjoying the hospitality of good Bishop Maccelle, she begged him to give them some spiritual instruction. He complied in a short discourse on the Eight Beatitudes. When he concluded she turned to her Sisters and said: " We are eight virgins, and eight virtues are offered to us as a means of sanctification. It is true that whoever practises one virtue perfectly must possess every other; yet let each of us now choose a virtue for special devotion." The Sisters, through courtesy and respect, requested St. Bridget, as superioress, to take the first choice. She at once took the beatitude of "Mercy " as the beautiful virtue to which she especially wished to devote herself. It was, in truth, a happy choice — one in which she has had many followers in " the Isle of Saints and Sages." St. Bridget's whole life was love in action. The wants of others touched her pure, noble, and affectionate heart. A good mother once brought her little daughter to see the Saint. The girl was about twelve years of age, and had been born dumb. Not knowing her infirmity, however, the Abbess caressed her, asking her if she intended to be a nun. There was no reply. The mother explained her child's condition ; but St. Bridget remarked that she could not let the girl's hand go until she received an answer. She repeated the question. "I will do whatever you desire," said the child, who, thus wonderfully cured, remained with her dear benefactress ever after. The holy Abbess took the most tender care of her religious. One of the Sisters was very ill and asked for some milk. But there was none. The Saint, however, ordered some water to be given to the patient. It was suddenly changed into rich, warm milk, and the miraculous draught cured the sick Sister. During one of her journeys a man came to her and related his domestic troubles. His wife, he said, hated him for some unknown reason, and peace had fled from his home. The Saint gave the poor fellow some water, directing him to sprinkle it through the house in his wife's absence. He did so, and his wife's dislike was turned into the most tender affection — an affection that lasted for life. On one occasion a leper came to the convent and asked to have his clothes washed; but as he was only master of what was on his back, it became necessary to provide him with clothing while this act of charity was in the course of accomplishment. St. Bridget desired one of her nuns to give the afflicted son of Adam a second habit which she did not use. But the nun was unwilling to obey, and as a swift punishment she was then and there struck with leprosy. At the end of an hour, however, she repented of her disobedience, and was cured by the intercession of the tender- hearted Saint. Another nun, happy in possessing the true spirit of obedience, provided the leper with clothing; and when his tattered rags were washed and returned to him he was healed of his terrible disease. " Thus," exclaims the Nun of Kenmare, from whose excellent work  we have gathered these details — "thus was God glorified; for the miracles of the saints are not for their own glory." And life for e'er secure." Our Saint enjoyed the most intimate friendship of St. Patrick. She foretold the date of his departure from this world, was present at his holy death, and supplied the winding-sheet — which she had long kept for the purpose — in which his blessed remains were wrapped. One of the most touching and beautiful incidents in the life of St. Bridget was her meeting with the young student, Nenedius. As she was leaving her convent on the plains of the Liffey, she met him running along with boyish impetuosity. The holy Abbess requested one of her religious to call him to her; but Nenedius was in such a hurry that he could scarcely be prevailed upon to stay a moment. The Saint enquired why he ran with such speed. " I am running to heaven," answered the boy.
" Would to God," said Bridget, " that I were worthy to run with you to that blessed place! Pray for me that I may one day enter there." "O holy Virgin!" exclaimed Nenedius, "pray for me that I may persevere in the path that leads to heaven." And the Saint prayed for the dear boy, telling him, in prophetic language, that on the day of her death she would receive the Holy Viaticum from his hands. 1 Bridget is from the Irish, and signifies strength. The name is sometimes written Brigit and Bride. 2 Faughart is in no way remarkable except as the birthplace of the Saint. It is near the town of Dundalk. The ruins of St. Bridget's old church are still here. The situation is very picturesque, looking out on the bay of Dundalk, the scene of many a notable event in Irish history. — Sister Cusack, Life of St. Bridget. 3 Her mother, Broeseach, was an O'Connor, and was of noble birth; both her parents were Christians. — Sister Cusack. 4 The celebrated Archbishop MacHale is directly descended from Bishop Maccelle, who received the profession of St. Bridget. — Sister M. F. Cusack, Life of Daniel O'Connell. 5 The little conventual building in Kildare was soon surrounded by a great city. We have said little, for such it was in its first beginnings, but it soon became a vast building and contained many hundred inhabitants. — Nun of Kenmare. 6 "Life of St. Bridget." May she lead us to beautiful heaven." There are churches dedicated to divine worship under the patronage of St. Bridget in Buffalo, Rochester, Pittsburgh, Cleveland, Philadelphia, San Francisco, St. Louis, New York, and countless other places in our country. John O'Kane Murray, Little Lives of The Great Saints (New York, 1880), 255-262.